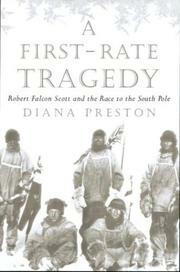 An imaginative, sympathetic biography of the famous and ill-fated Antarctic explorer. English biographer Preston, author of a life of Bonnie Prince Charlie (The Road to Culloden Moor, not reviewed), attended a girls— high school in Hampstead in the entrance hall of which were emblazoned the words of Robert Falcon Scott: —Had we lived I should have had a tale to tell of the hardihood, endurance and courage of my companions which would have stirred the heart of every Englishman.— Scott did not live, of course: he and four companions who had set off to find the South Pole in 1912 died horribly of starvation and cold, and in any event they were beaten to the pole by the Norwegian explorer Roald Amundsen. Ironies attended their deaths, not the least of them the fact that Scott and his team perished just a few miles from a depot of food and supplies; all the same, Preston rightly notes, those deaths were not in vain, at least not on the national-pride front. England had nearly lost the Boer War, and the Titanic had recently sunk; the nation needed a hero and found one in a young naval officer who feared for the character of his own soul, thanks to a domineering father who accused him of indolence and cowardice, and who had a terror of being thought —below par.— That Scott acquitted himself admirably on the ice and was considered a model leader by his men did not do much to give the explorer greater self-esteem, but, writes Preston, he confined expressing his terrors to his much-quoted diary, in which he recorded his last moments in the hope that he would thereby —make a tale for our generation which I hope may not be lost in the telling.— Preston gracefully retells that stirring, unmistakably heroic, and sadly doomed adventure for a new generation.